On the border Between Marches and Romagna and 13 Km far from Pesaro there's Gradara, splendid medieval village perfectly conserved and dominated by its beautifulst Rocca. Its history was born in the Middle Ages around year 1150 when the nobles Pietro and Ridolfo De Grifo stole the land to Pesaro and began to build the central mastio (main and central part of the castle). Lost the protection of the Pope the De Grifo was replaced with the powerful Malatesta family, nobles of Rimini and Cesena, in the person of Malatesta da Verucchio said the Centenario. This family decided to enlarge the Rocca and to build the Castle with its present aspect. In 1463, Pope Pio II excommunicated Sigismondo Pandolfo Malatesta and recruited the duke of Urbino Federico da Montefeltro who besieged the village and gave it back to the Roman Church which passed it under the powerful of Sforza family. To this followed all the powerful families of the XVI century: Della Rovere, Borgia, Medici. The strategic fortress of Gradara returned then to the church in 1641 until its unification to the Reign of Italy. Gradara is medieval village of rare and intact beauty. 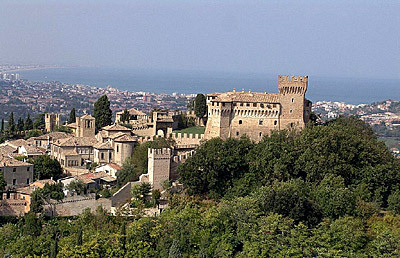 The visit to the village and to the Castello Malatestiano are important stages for the knowledge of the regional territory. To be visited beyond the Rocca, the Church of Saint Giovanni (XIV sec.) with a beautiful wooden crucifix, the Historical Museum, and the Olive Trees Garden. Do not forgot to visit the rounds walkway of the town-walls (XIV century), from where it's possible to enjoy a wonderful panoramic view. Info, accommodation and guided tours in Gradara.